Vera Lucille Knox was born in Parker County, Texas on January 10, 1918. 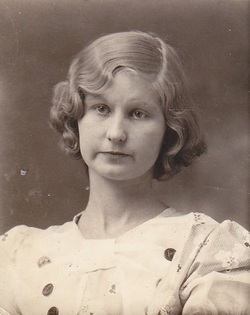 She was the fourth of nine children born to William Alexander Clark & Annie Ethel Mullinax. 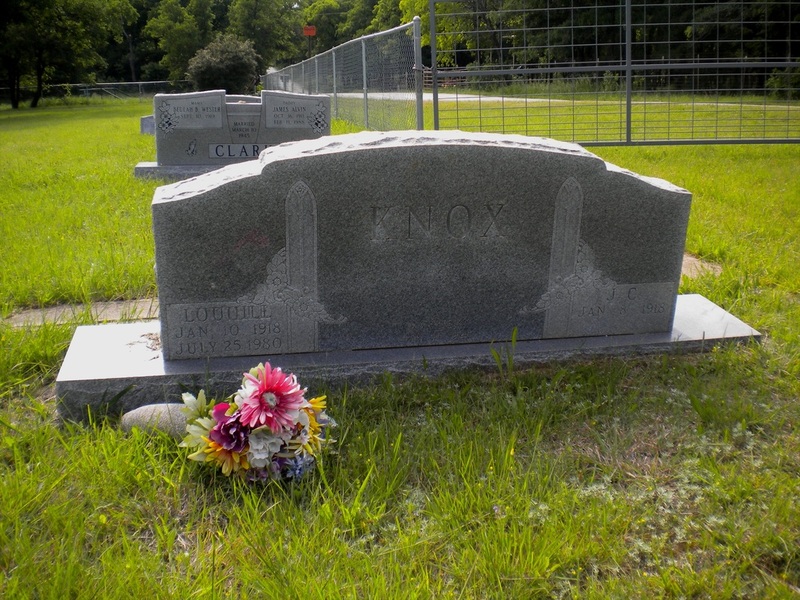 The Clark’s had already been in Parker County for many years when the Knox family arrived to the area. The Knox’s moved into what is now known as the old Savage house, just south of Friendship Baptist Church. JC Knox was the fourth of seven children born to James Porter Knox and Carrie Bell Smith. He was born January 8, 1918. The Clark’s were the Knox’s new neighbors to the east so the Clark’s brought a cake over to welcome them. JC was so busy looking at the pretty blonde girl (Lucille Clark) that he got distracted and a horse stepped on his foot. This may have been a contributing factor in the arthritis he developed later in life. Lucille married JC Knox on January 11, 1941. JC worked as a painting contractor to support his new family. They purchased a home on the North Side of Fort Worth. JC and Lucille had one child, Dan Leslie. Danny would later grow up and marry Rebecca Marie Coffee in 1968. They had three children: Kerry Elizabeth, Jay Robert Curtis and Kevin Daniel. Lucille’s brother, Odis, lived about a block away with his wife and five children. So the two families spent a lot of time together. In 1976 JC and Lucille sold their house in Fort Worth and moved onto the property that Lucille’s mother had given her. The property originally belonged to James Edward “Jim” Clark and was part of the property that Lucille had grown up on. It was located just north of Clark Cemetery on Friendship Road in Parker County, Texas. I remember helping them dig the hole for the outhouse. When Lucille’s brother, Odis, retired from General Dynamics he moved in with Lucille and JC on their farm in Weatherford until he eventually purchased a mobile home and put it on the adjacent land his mother had given him. They both had large gardens and I remember we (Granddad-Odis, Lucille, JC, Danny, Becky, Kerry, my mom & dad & brothers & sister) would all go work JC & Lucille’s garden and then move to Granddad’s (Odis’) and all work together. At days end all of us kids would ride back to the house in the back of the pickup, usually on top of a pile of potatoes, corn, watermelon or whatever had been harvested that day. We were hardly ever inside; everyone would sit around in metal/porcelain lawn chairs. To this day, every time I see a porcelain lawn chair I think of Lucille. I remember Lucille as being very energetic, hard working, warm, and funny. In fact, in my mind I can’t picture her sitting down. In my memories she is always gardening, cooking or making homemade vanilla ice cream out in the yard. She was always so busy tending to the needs of every one else. As everyone got older the gardening stopped. But JC and Lucille would make a visit to Odis’ everyday just before dark. They would all three sit inside JC’s pickup and just talk. Lucille usually sat in the middle so JC and Odis could spit their Redman chewing tobacco out of the windows. Odis’ grandkids would spot the familiar blue truck with the camper coming up the road every evening and let him know they were there. Then Odis would make the stroll out to his driveway to meet them (usually picking weeds on the way). Lucille passed away July 25, 1980. I had been to other funerals before but Lucille’s was the first I had been to where I actually knew the person. After Lucille died JC would still make his nightly visits. But it just wasn’t the same seeing the pickup without Lucille. I’m sure it wasn’t the same for JC or Odis either. JC died September 30, 1996. Lucille and JC are buried next to each other in Clark Cemetery.